North Division: Prospects who could be seen in the Southern League. Tennessee Smokies: The Smokies are the AA-affiliate of the Chicago Cubs. They finished the 2013 season 42-27 and in first place of the North Division. The Smokies are going to see quiet a bit of talent this year. Kris Bryant - Bryant is the No. 2 prospect in the Cubs organization. Bryant was drafted in the first round of the 2013 draft. After beingd drafted Bryant tore up the lower leagues by hitting .336 with 9 home runs and 32 RBI's in just 36 games. Bryant will have a quick stop in Tennessee as he could find him self in AAA-Iowa if he puts up the same numbers as last year. C.J Edwards - Edwards was acquired by the Cubs in 2013, in a trade for Matt Garza. Edwards had went 8-2 with a 1.83 ERA with 122 strikeouts in 18 games with Lo-A Hickory while with the Rangers. Once acquired by the Cubs he was sent to Hi-A Daytona where he posted a 1.96 ERA with 33 strikeouts in just 6 games. Edwards will start with Tennessee this year and the sky is the limit for this young prospect. Chattanooga Lookouts: The Lookouts are the AA-affiliate of the Los Angeles Dodgers. They started off last season with tons of prospects but with the call up of Yasiel Puig and a few other players it brought them back down to a mediocre level. Corey Seager - Seager was a first round pick for the Dodgers back in 2012. Seager had a pretty big year last year where he hit .282 with 16 homeruns and 79 RBI's in 91 games split between LoA-Great Lakes and HiA Cucamonga. Though struggling in HiA, Seager should see AA at some time this year even if he starts off back at HiA-Cucamonga. Erisbel Arruebarrena - Erisbel defected from Cuba this year and the Dodgers signed him right up. Not much is known abut Arruebarrena except for his time playing with the Cuba national team. The 24 year prospect will get his first taste of Professional Baseball this year. Honerable Mention: #17 OF Scott Schebler, #19 RHP Pedro Baez, and #25 INF Darrell Sweeney. Jackson Generals: The Generals are the AA-affiliate of the Seattle Mariners. The Generals started off the season much like the Lookouts with many prospects such as Julio Morbin, and TaiJuan Walker. Once Walker was sent up the Generals took a big hit on their rotation. D.J Peterson - Peterson was a first round pick by the Mariners in the 2013 draft compared a lot to Kris Bryant of the Cubs. Peterson was drafted out of New Mexico University in his first professional season Peterson hit .303 with 13 homeruns, and 47 RBI's in just 55 games. Peterson could start the season at HiA but I wouldn't be expected if he isn't up to AA-Jackson by midseason. Patrick Kivelhan - Another top rated 3B in the Mariners organization Patrick was drafted in the 4th round of the 2012 draft. Patrick split time last year between LoA-Clinton and HiA-High Desert where he hit .300 with 16 homeruns, and 90 RBI's. Patrick will most likely be the starting 3B for the Generals this year. Courtney Hawkins - Hawkins was a first round draft pick in 2012 for the White Sox. Hawkins came on with a bang when he made his professional debut but, last year slowed down a lot. Hawkins played last year with HiA-Winston Salem where he only hit .178 with 19 homeruns and 62 RBI's in only 103 games. Now that sounds great it doesn't include his 160 strikeouts and .249 OBP. Hawkins will most likely start off back in HiA-Winston Salem but if he can get his numbers back up he should find himself in AA by midseason. Huntsville Stars - The Stars are the AA-affiliate of the Milwaukee Brewers. The Stars had a mediocre year last year with few big named prospects but this year looks a lot different and could be a big year for the Stars. Mitch Haniger - Haniger was drafted in the first round of the 2012 draft and is making huge strides every year since being drafted. Haniger split time between LoA Wisconsin and HiA-Brevard County. Between both leagues Haniger hit .270 with 11 home runs, 57 RBIs, and .360 OBP. Haniger should get his first look at AA ball and if he plays like he has been he could see majors by 2015. Nick Delmonico - Delmonico was drafted in 8th round by the Orioles in 2011, the 21 year old was acquired last year by the Brewers and was sent to HiA-Brevard County. While with the Manatees he struggles a little hitting only .194 with 9 RBIs but before being acquired he was hitting .243 with 13 homeruns, 30 RBI's and a .350 OBP. Delmonico should be a little more comfortable with his surroundings this year and he should get back on track. He could start back at HiA-Brevard County but don't be surprised if he is up with the Stars very soon. Honerable Mentions: #2 OF Tyrone Taylor, #7 SS Orlando Arcia, #13 SS Yadiel Rivera, #18 LHP Jedd Bradley. *Honorable Mentions are players that could make it up to Southern league this year or are lower ranked prospects. Yesterday (9-12-13) Baseball America released the 2013 MiLB All Star team, which consist of the best ball players through out the Minor Leagues. It is the best players in every league from Lo-A to AAA and it list all 9 fielding positions plus a DH and a couple of other pitchers. I will list both teams then go back and cover some of the players and what to expect from the next year. As you look at the 1st team you will recognize a trend its the Minnesota TWINS!!! The Twins have one of the if not the best minor league systems out there right now. The Twins have 4 players that made the 1st team All Star team. Sano and Buxton are the keys for the Twins both players are under 21 Buxton at only 19 and Sano at 20. They are the future of this organization. After the Twins traded Justin Morneau to the Pirates they called up Chris Colabello who will finish the season with the team and i would not be surprised if Pinto makes the team out of Spring Training next year. At SS you have the young and talented Xander Bogaert who received his call up this September for the Red Sox. Bogaerts numbers this year were very impressive. He hit .284, with 9 HR's and 32 RBI's at AAA-Pawtucket. Now his numbers are not as good as the MiLB AST DH who aswell is a SS. Javier Baez. Baez had a breakout year this year split between Hi-A Daytona and AA-Tennessee Baez hit .282, 34 2Bs, 37 HR's and 111 RBI's. He also, put up 2 more HR's and 6 RBI,s in the Southern League Post-Season. Though Baez's offensive numbers are better than Bogaerts, Baez commited 44 Errors at the shortstop postion which is what put Bogaert in the lead. In the OF for the first team is some impressive players Buxton, Pederson, and Springer. Buxton with the Twins organization is the next big deal. At only 19 years old Buxton has some time till he gets to the show but when he does watch out!!. Pederson is the No. 1 prospect in the Dodgers organization. Pederson has been overlooked and shadowed through out the 2013 season due to Yasiel Puig, Matt Kemp, Carl Crawford and Andre Either but, like the Dodgers owners name Magic is keeping this one a secret. I expect the Dodgers to trade Crawford or Either this off-season to make room for Pederson to make his MLB debut next april. Now to the pitching, Though i was surprised to see White Sox No.1 pitcher Scott Snodgrass on either list it is still impressive. Archie Bradley for DBacks is the No.1 pitcher in all of MiLB in my opinion the former Oklahoma commit took of the AA-Southern League after his call up in mid-may. Posting a 14-5 W/L record, 1.84 ERA, and 162 SO's. C.J Edwards was received by the Cubs when they traded Matt Garza to the Rangers and since his time at Hi-A Daytona Edwards has dominated. 1.88 ERA, 8-2 w/l record, 155 strikeouts and most impressive he only gave up 1 HR all year. Edwards will be a dynamic add on the young pitching staff coming up through the Cubs organization. A couple of other names to through out there is TaiJuan Walker and Kyle Hendricks. Both pitchers started off at AA and Walker is getting some reps at the MLB level Hendricks has been dominating for AAA-Iowa. Both players should be starters on their big league teams. WIth that being said According to Baseball America the 2013 MiLB player of the year is Byron Buxton. This 19 year old man had a amazing this season. Posting a .334 batting average, 19 2B's, 18 3B's, 12 HR's, 77 RBI's and 55 SB's. Buxton brings alot of speed, power, and athleticism to the table for the Twins. will probably see atleast one more full season in the minors but expect this young man to make a even bigger name for himself. He will most likely be the 2014 No. 1 prospect for BA, like I said the young man is only 19!! The sky is the limit for him!! We are now mid season in the MLB and at the first of the season we put out a column about the top 10 prospects in Minor League Baseball and since then we have several people graduate and a couple more drop out due to injuries. So I will cover 1-10 and then talk about some significant drops and add-ons. 10. Javier Baez - SS - Chicago Cubs - Baez is the No. 1 Prospect in the Chicago Cubs organization and the 1st round pick in the 2011 draft. In Hi-A Daytona Baez hit 4 homeruns in one game and has showed several times his soft hands and good plays at the shortstop position. I have actually gotten a chance to see Baez play and he is impressive in his first game at AA-Tennessee Baez hit a towering homerun to centerfield and is everything you would imagine in a future of a organization. 9. Carlos Correa - SS - Houston Astros - Correa was the No. 1 Draft pick in the 2012 MLB draft. Correa has found himself at Lo-A this season where he has put up great numbers from the plate. His speed has raised some eyebrows because it might not be up to par enough to be a long term SS but he is only 19 years old so he has time to develop. 8. Christian Yelich - OF - Miami Marlins - Yelich is now the No. 1 prospect in the Marlins Organization since Ozuna and Fernandez graduating to the bigs. Yelich has be devastated this season by injury after injury but he could be looking for a move back up to AA-Jacksonville and get the ball rolling again. 7. Taijuan Walker - RHP - Seattle Mariners - Taijuan Walker has dropped from the begging of the year where he started the season out as the No. 5 prospect in the MiLB. Many scouts say that Walker could pitch in the big leagues right now but, he continues to struggle with control issues. I have seen Walker pitch several times and he is impressive. Since his time with AA-Jackson, Walker has been promoted to AAA where he has shined throwing 22 scoreless innings when he was first called up. Walker could be a big help in the Mariners postseason push. 6. Archie Bradley - RHP - Arizona Diamonbacks - Bradley is No. 1 Prosepect now in the Diamondbacks organization. So far this season Bradley is 8-4 with a 2.06 ERA and 115 Strikeouts. Bradley is on pace to be in the big leagues in the next 2 years and I believe he it could be sooner than later. 5. Francisco Lindor - SS - Cleveland Indians - Lindor has shot up the rankings with his impressive play at SS while at hiA-Carolina. Lindor will eventually replace Cabrera for the big league team in the next couple years. Lindor has soft hands and good bat and could be a valuable person in the Indians future. 4. Xander Bogaerts - SS -Boston Red Sox - Bogaerts has found him self at AAA-Pawtucket this season at only 20 years old. The Red Sox No. 1 prospect has shown that he is more than ready to make in to the big leagues and he could see it this post season. 3. Miguel Sano - 3B - Minnesota Twins - Sano is the No. 2 prospect in the Twins organization and he deserves it. Sano has 22 homeruns and 65 RBI's in split time between Hi-A and AA. Sano only 19 years old is not being rushed and is being given the time to develop properly. 2. Oscar Taveras - OF - St. Louis Cardinals - Taveras has been sitting at this No. 2 spot since the first of the season. Taveras has struggled with some minor injuries this season but has still put up some amazing numbers. Taveras is just basically hanging out waiting on the call from St. Louis. 1. Byron Buxton - OF - Minnesota Twins - Buxton has been one of the top stories of this year. He was one of the top talents in the 2012 draft but there was a lot of question marks. Well Buxton has erased all those question marks and has landed the NO. 1 Prospect spot for MiLB. So far this season Buxton has hit 9 Homeruns, 34, Stolen Bases, and 63 RBI's. Buxton is one of the best raw athletes we have in the league and he is just going to get better and better as time goes on. This past Monday June 3 the Tennessee Smokies hosted a double header vs. the Jackson Generals. The Generals are the AA-Affiliate of the Seattle Mariners. The Generals have quite a slew of top prospects especially #3 Prospect in all of MLB Taijuan Walker. I had seen Walker pitch last year for AA-Jackson and he was impressive but I was excited to hear I would get to see him again. Walker stands 6'4 and about 210 and he has an impressive stretch. he stayed a consistent 92 - 95 on his fastball and his breaking ball was sick you could see it break from a mile away. If you look at just numbers Walker doesn't look that impressive but for just 20 years old he is amazing.. So far this year Walker is 3-6 with a .267 ERA, and 68 SO in just 64 innings pitched but like I said those number don't do any justice to the pure talent this kid has. Now back to the game, the first game was a pitching dual. As you know Walker was on the bump for the Generals and for the Smokies it was Kyle Hendrick. Hendrick wasn't on the Cubs preseason top 25 prospects at the begging of the year but he will be in the top 20 next year. Hendrick has been phenomenal this year he was even named the Cubs minor league pitcher of the month. So far this year he is 6-2, 230 ERA and 55 SO's. Hendricks really stole the show he pitched and complete game 7 inning shutout. (minor leagues play 7 innings when there is a double header.) Now in the second game it was more dominance by the Smokies. The Smokies sent A.J Morris out to start the game and then brought in Tony Zych and, Kevin Rhoderick. all 3 pitchers pitched pretty good only giving up one run to the Generals. The Generals sent James Gillheeney to the mound and lets just say it wasn't pretty the Smokies put up 4 runs on him in the 4th inning before he was pulled then they brought in Andrew Kittredge who didn't have much better luck when in the next inning he was taken deep by Cubs #12 prospect Christian Villanueva. The Smokies went on to win the 2nd game 7-1. I am actually planning on attending 2 games this upcoming week when the Smokies take on the Mississippi Braves. I plan on attending the Thursday game where the Braves will have Brandon Beachy making a rehab start and on Saturday. Today May 9th is my birthday so I decided to treat myself to a minor league baseball game. So I attended the Tennessee Smokies (AA-Cubs) vs. Birmingham Barons (AA-White Sox). It was your typical windy city rivalry just the minor league addition. The series its self has been a great one to see. Thought the Barons have won each of the first 3 games the today and yesterday have been great games. The first game the Barons took in 5 innings 16-0 rain cut the game short, in the 2nd game the team made up for the innings lost the night before. They played 14 innings and the Barons took the W with a 12-11 win. I am going to start off by breaking down the top prospects that played in todays game and then we will move to todays game. The Smokies only showed off 3 of the Cubs top prospects giving #12 prospect Christian Villanueva and #14 prospect Matt Szczur the day off; #10 prospect Arismendy Alcantara, #13 prospect Alberto Cabrera, and #24 prospect Trey McNutt did play but not very well. SP Alberto Cabrera: 4.2 IP, 6 ER, 13 Hits, 3 BB, 5 SO. RP Trey McNutt: 1.2 IP, 1 Hit, 1 ER, 2 BB, 1 SO. The Barons had showcased 4 of the White Sox top prospects #5 prospect Keenyn Walker, #12 prospect Andy Wilkins, #14 prospect Marcus Semien, and #19 prospect Kevin Vance. The Barons are a very impressive team and have put on the runs every game they have played vs. the Smokies. and they continued to put them up this game. 2B Marcus Semien: 4 AB, 1 R, 1 Hit, 1 SO and 1 BB. The Barons started the game with a 2 run 1st inning then, the Smokies came back to take a 3-2 lead in the bottom of the 1st with a 2-run shot by DH Rafeal Lopez. The Barons continued to put the bat on the ball and score another 2 runs in the top 2nd and the top 1 run at the top of the 3rd. Now leading 5-3 in the bottom of the 4th Smokies RF Jonathan Mota hit a laser beam shot barely over the left field wall helping rally the Smokies to a 3 run 4th inning bringing the score Smokies 6, Barons 5. the game continued to go back and forth until the Barons pulled away in the top of the 9th winning by the score 9-7. If I had to pick a defensive player of the game it would go to Smokies SS Alcantara he has very quick hands and is very good defensivly reminds me of Andrelton Simmons of the Atlanta Braves. If I had to pick a Offensive Player of the Game it would be Barons 1B Dan Black in 33 games he has 33 RBI's which is beyond impressive. He puts the bat on the ball very good and is just all around impressive. White Sox #5 Prospect Keenyn Walker taking a called strike 3. 10. Tyler Skaggs – Tyler Skaggs is a southpaw in the Diamondbacks organization. He has started the 2013 season with the AAA-Affiliate Reno Aces. Tyler has put up pretty good numbers but not as good numbers as they are expecting. In 5 games he has 24 SO, 12 BBs, and not given up any homeruns but his record is sitting right over 6.00. Tyler is posting a 6.15 ERA giving up 18 ER. Hopefully Tyler make the changes he needs and gets back to dominance he is capable of. 9. Gerrit Cole – Cole is the No.1 prospect in the Pirates organization as of right now he is with the AAA-affiliate Indianapolis Indians. Cole has continued to show his consistency with a fastball reaching 98mph consistently. With Indianapolis Cole has put impressive numbers in 5 games he has went 2-1 with 19 SO, 15 BBs, but has only giving up 6 ERs. Right now the Pirates are proving they are a good team and going to fight for the NL: Central. Cole could see a call and help this Pirates team make a run to the playoffs. 6. Travis D’arnaud – C - Travis is one of the biggest bust in the prospect list. Travis has been a injury prone catcher since day 1 and I don’t think he will get to the show until he switches from the catcher position help secure his health. While healthy this year Travis has put up good numbers batting .250, with 1 HR, 8 RBI’s and drawing 12 walks. Travis has not played since April 17th. 5. TaiJuan Walker – Walker surprisingly started the season off the season in AA-Jackson. Jackson is the No. 2 Prospect in the Mariners organization. Walker has continued to improve his fastball but he seems to still have problems with his BB’s. In 6 games he has gone 3-2 with a 1.54 ERA, 39 SO’s, 20 BB’s and only giving up 6 runs. Walker is slowly climbing the ladder and will reach his stardom very soon! 4. Will Myers – Will Myers an OF for the Tampa Bay Rays. He is the No. 1 prospect in the Rays organization and putting up awesome numbers for the AAA-Affiliate Durham Bulls. Myers is just waiting for his call to the show and it could come at anytime. Myers is batting .289 and just recently caught on fire hitting 3 homeruns in the last week of April. 3. Oscar Teveras – Teveras is the No. 1 prospect in the very talented Cardinals organization. Oscar is batting just under .300 this season hitting 2 HR’s, 9 RBI’s. and has 22 Hits. Oscar almost made the roster out of camp and he could be on the team by mid season. 2. Dylan Bundy – Bundy is a great power pitcher and the No. 1 prospect in the Orioles organization but, Bundy has not seen any PT. The Orioles top pitching prospect has been having trouble with his throwing elbow and did go see Dr. James Andrews about his elbow. He got a shot in it to see if that help in hopes he doesn’t have to undergo tommy john surgery. Hopefully Bundy can overcome the injury and get back on the field soon. Teveras but nothing has broke official yet. Last night I attended the home opener for the Tennesee Smokies the AA-Affiliate for the Chicago Cubs. The Smokies took on the Chattanooga Lookouts the AA-Affiliate of the Los Angeles Dodgers. The Smokies are lacking some talent right now with top prosepects Jorge Soler and Albert Almora at A-Daytona but they do have 1B Justin Bour and OF Matt Sczczur. The Lookouts on the other hand do have some of the Dodgers top prospects #2 Yasiel Puig and #4 Joc Pederson. The Smokies put Dallas Beeler on the mound and, the Lookouts sent Zach Lee to the mound. Beeler had a decent start pitching 6 innings, 6 hits, 2 earned runs, 2 walks, and 3 strikeouts but, Lee was the stud of the show when his only mistake was a game tieing homer in the bottom of the fourth by Justin Bour. Lee went 7 innings, 5 hits, 1 earned run, 1 walk, and 7 strkeouts. Lee recorded his 1st win this season and Beeler recorded his 2nd loss for the season. Lookouts Puig only played about 4 innings. The young cuban defector is continuing to show he is ready for the big leagues after having an awesome spring. He has went 7-15 this season with a .467 average, 1 HR, 3 RBI's, and 1 stolen base putting up numbers like that is going to get Puig to the show very soon and he looks the part standing at 6'3 240lbs. Pederson had a very impressive night as he as well has had all year. Joc has went 1-3 last night with a big RBI to give the Lookouts the lead again in the 7th. Joc so far has 5-22 with a .238, 5 hits, 2 doubles, 2 homeruns and 2 stolen bases. The 20 year olds bat still has some improvements to make but he is makeing lots of improvements every day. Pederson's top attribute is his defense, Joc played CF and he ate up as much as the field as he could. Matt Szczcur hit a shot that could have put the Smokies but Pederson ran from Mid center to almost the right centers warning track to make a beautiful catch. once more. I did come away with a prize before the game started I did get an autograph ball from #4 prosepect Joc Pederson. I went for Puig but he didn't sign. For more on the Southern League checkout my blogs on Southern Division and Northern Division. This is a cotinuation of my previous blog about the MiLB Southern League. In the previous blog we covered the South division. You can find the link here! The Northern Division could be the best division going into the season. The Nothern teams could be covered up in talent. The the Northern division consist of teams from the Cubs, White Sox, Dodgers, Brewers, and Mariners. Last year the Chattanooga (dodgers) won the southern league title but, the Smokies (Cubs) could be the team to watch out for and thats who we will start off with on this segment. Tennessee Smokies - The Tennessee Smokies are the double-AA affiliate of the Chicago cubs, the Smokies finished the 2012 seson 37-33. The Smokies could see tons of young talent this year!!! Jorge Soler OF - Was the best prospect our of Cuba. He was signed in 2012 by the Cubs. The Cuban defector has a very good bat and while he is predicted to start the season off in HiA Daytona. Soler could easily be in AA-Tennessee by midseason. Soler only played 34 games last year split between Rookie League and LoA Peoria. Soler hit .299 with 40 hits, 5 HRs, 25 RBI's and 12 Stolen Bases. Soler is said to have above average arm strength and once he gets the right field down he will be a real valuable source for the Cubs. Chattanooga Lookouts - The Lookouts are the AA- Affiliate of the Los Angelas Dodgers. The lookouts are the returning champions from 2012. With the Dodgers changing owners and money being put into the team alot of young talent is being dangled down in the minors or being traded for big time athletes. I suspect the Lookouts to stay in rare form and stay atop of the southern league. Jackson Genrals - The Generals are the AA- Affiliate of the Seattle Mariners. The Generals had a really good season last year finishing only 4 games behind Chattanooga. The Genrerals where loaded with top pitching talent but struggled with fielding and offense. This year could be a fall out for the Generals. The Generals could be without either this season. Just depending on where the pitching talent goes. Taijuan Walker RHP - Walker is probably the most promising of the Mariners talent and, I can speak to that first hand. I seen Walker pitch against the Smokies last Spring and wow he has talent. Walker piled up strike out after stikeout i think finishing the game with almost 10 if not more. Walker has a Fastball that reminds me of a top of the rotation pitcher. Walkers only downfall is his control. No matter how fast his fastball was or how good his curveball was it was consistent but, once he learns to control each pitch... WOW everyone watch out! I really doubt Walker will start the season off in AA-Jackson but if there is a chance he could still start off in AA. Baseball America's Grade: 70. Birmingham Barons - The Birminham Barons are the AA-Affiliate of the Chicago White Sox. The Barons had a rought year last year finishing 8 game out of first. The Barons though have alot of young talent that could make their way to AA this year. Courtney Hawkins OF - Hawkins was drafted in the first round of the 2012 MLB draft. straight out High School Hawkins became a household name when after being selected in the draft did a back flip on National TV. He was fastly called and told we would not be doing those any more. Hawkins played in a short league last year but, still put up awesome numbers. Reaching HiA in his first partial season Hawkins .284, 65 hits, 8 HR's, 33 RBI's, and 11 Stolen Bases in only 59 games. Hawkins will be a top notch talent for the White Sox i expect him to start off in AA- Birmingham but could finish the season in AAA- Charlotte. Baseball America's Grade: 60. Keenyn Walker OF - Walker was a highly anticipated football prospect coming out of High School. Walker went to Arizona State JUCO where he led the league with stolen bases. Walker then was drafted by the White Sox in the 1st round of the 2011 draft. Walker Finished last year in HiA Winston Salem, he struggled in the little time he was there so I expect him to start off the season there but, if he puts up the promising numbers he has shown in the past he could see some time in AA. Baseball America's Grade: 50. Huntsville Stars - The Huntsville Starts are the AA-Affiliate for the Milwakee Brewers. The Stars finished in last place of the Northern Division. The Brewers organization has topped out with prospects with only a select few in the organization. they are all either sitting at AAA- Nashville or just starting and down in HiA Brevard Co.
Taylor Jungmann RHP - Jungmann is the only really top prospect that could see time in AA- Huntsville, Taylor is the #3 prospect in the Brewers Organization. Taylor spent his 2012 season with Hi-A Brevard where he put up promising number. Jungmann went 11-6 W/L, 3.53 ERA, 99 Strikeouts, 46 walks, in 153 innings. Jungmann will probably start in Huntsville but, could finish in AAA-Nashville with numbers like last year. 2013 Top 10 MLB Prospects. 10. Tyler Skaggs LHP - Skaggs is a southpaw from the Arizona Diamondbacks organization. He is Arizona&apos;s #1 prospect and with Trever Bauer&apos;s departure to Clevland Skaggs will be depended on a whole lot. The Dbacks also, picked up RHP Randall Delgado in the Justin Upton trade. The Dbacks are hoping Delgado can hold his own and by Skaggs some time but, if Delgado strugles dont be suprised to see Skaggs in the rotation. 9. Gerrit Cole RHP - Cole is a promising pitcher in the Pirates Organization. He is Pittsburg&apos;s #1 prospect and he deserves to be it 100%. Cole is a power pitcher, his 4-seam fastball averages at 96 - 98 mph and has reached highs of 101 mph. Cole also, has a nasty slider that runs about 88 - 90. Cole seen most of his playing time last year in AA where he posted a 2.90 ERA, with 60 strikeouts in only 12 games. Cole will start the season off in AAA. I look at him to play a full season in AAA but if the Bucos make a run for the playoffs then Cole could be a big part of the Pirates bullpen. I look at Cole to make the Starting Rotation no later than the 1st of 2014. 8. Zack Wheeler RHP - Wheeler is young gun in the Mets Organization. Wheeler was aquired by the Mets in the the 2011 trade for Carlos Beltran. Wheeler had some promising numbers while in the Giants organization but went back to to some High School antics and dropped back off in the 2012 season. If Wheeler can get back in the groove he had while in San Fran Wheeler could be in the Starting Rotation by mid season. Especially after the departure of 2012 Cy Young Winner R.A. Dickey. 7. Jose Fernandez RHP - Jose is a young prospect in the Marlins Organization. Fernandez is the Marlins #1 prospect and he is only 20 years old. This 20 year old phenom posted amzing numbers in 2012. Splitting time between LoA Greensboro and HiA Jupiter. Fernandez posted 14-1 W/L record with 157 strikeouts and only 35 walks in 134 innings. Fernandez will most likely start the season in AA Jacksonville but if he keeps up the hard work and puts up the amazing numbers he should finish the season in AAA if not the majors. I expect Fernandez to be in the Starting Rotation by the start of the 2014 season. 6. Travis D&apos;arnaud C - Travis is a Catcher in the Mets Organization. He was aquired by the Mets in the R.A. Dickey trade to the Toronto Blue Jays. Travis has potential to be in the bigs by mid season. As long as he can avoid injuries that devestated him in 2012. In only 67 games last year Travis hit .333, 93 hits, 21 HR&apos;s, and 52 RBI&apos;s. I look at Travis to start off in AAA and as he becomes comfortable with Top Prospect Zack Wheeler both prospects could see MLB time together by mid season. 5. Taijuan Walker RHP - Walker is RHP in the Mariners Organization. Walker is another 20 year old phenom. In 2012 at AA Jackson Walker posted a 7 - 10 W/L, 118 Strikeouts, and 50 walks, in 127 innings. Walker was the youngest pitcher in the Southern League last year by almost a full year. With his youth I expect Walker to start off the 2013 season back in AA Jackson for more development but, if Walker has a good Spring he could be seeing his first full season in AAA. I actually got an oppurtunity to see Walker pitch several times in the 2012 season and WOW he is good. With a fastball sitting 93 - 95 mph. The only reason I dont see Walker starting off in AAA is he had somewhat of a control problem but, once that is figured out Walker could be in the Starting Rotation by the start of the 2014 season. 4. Will Myers OF/3B - Will Myers is a OF/3B in the Rays organization. Myers was aquired in the trade that sent James Shields to the Kansas City Royals. Myers has the best oppurtunity of making the Opening Day Roster for the Rays. While in AAA, last year Myers hit .304, 118 hits, 36 HR&apos;s, and 109 RBI&apos;s. I expect Myers to start the season in AAA Durham but he will for sure be in the every day lineup by mid season. 3. Oscar Tevaras OF - Tevaras is a the #1 Prospect in the Cardinals Organization. Tevaras also, only 20 put up amazing numbers in AA Springfield last year where he hit .321, 153 hits, 23 HR&apos;s, and 94 RBI&apos;s. Tevaras is expected to replace Carlos Beltran at the end of the 2013 season. With saying that if Carlos Beltran can stay healthy I believe Tevaras will spend most of the 2013 in AAA Memphis but, if the injury prone Beltran does go down with an injury dont be suprised to see Tevaras gets the call. 2. Dylan Bundy RHP - Bundy is the #1 prospect in the Orioles organization. Exploded on the scene in 2012 after being drafted by the Orioles in 2011 he only spent 23 games in the Minors before getting the call to the majors. Bundy became the fourth 19 year old pitcher to pitch in the MLB in the past decade. Bundy offers a crazy combination of control and power. His fastball sits at 95 - 98 mph. Bundy&apos;s best pitch is his Cutter that runs in the high 80&apos;s. Bundy seen some relief play in 2012 and, I expect him to start the season off in AAA but, if he keeps up the promising work he will be making everyday starts in no time. Baseball America says that "Bundy could be the best homegrown player in the Orioles organization since Mike Mussina. 1. Jurickson Profar SS - Profar is the #1 prospect in the Rangers Organization. Profar became an instant sensation before he was in high school. In 2005 Profar helped lead Curacao to its first ever Little League World Series. Profar was later drafted by the Rangers in 2009. Profar made the jump from AA Frisco to the Bigs in 2012 where he appeared in 9 games while Elvis Andrus was out with injury. Profar could start the season off in AAA but, with the departure of Josh Hamilton to the Los Angelas Angels of Anahiem. Dont be suprised if Profar makes the big league roster and plays at 2nd while Ian Kinsler moves to the OF. Baseball America&apos;s Grading Scale goes as Follows. 75 - 80: Franchise pllayers, and No. 1 Starters, such as Mike Trout, Miguel Cabrera, Clayton Kershaw, and Justin Verlander. 65 - 70: No. 2 starter and pernnial all-stars in the mold of Matt Cain, Matt Kemp, and Adrian Beltre. 55 - 60: First division regulars and No. 3 Starters and elite closers, such as Craig Kimbrel, James Sheilds and, Austin Jackson would earn these Grades. The Southern League is a Professional Minor League Baseball division. In 2012 the Southern League hosted many top notch prospects that did or could recieve the Call to the Bigs in 2013. Players such as Tyler Thornburg, Christian Bethancourt, Sean Gilmartin, Stolen-Base Record holder Billy Hamilton, Tyler Skaggs, Andrelton Simmons and many more but, 2013 could be a huge year for prospects in the Southern League. Im gonna break down each team and their prospects that could be seeing alot of playing time in the Southern League. This blog will be the South Division. Mobile Bay Bears: The Mobile Bay Bears are the AA affiliate of the Arizona Diamondbacks. They finished in last place last year but are looking to bounce back. The Bay Bears could see several top prospects. Archie Bradley SP - Archie was a first round draft pick by the D-Backs back in 2011 seing most of his time in LoA South Bend last year. Archie put up significant numbers posting 12-6 w/l record an ERA of 3.84 and 152 Strikeouts. Archie is the #3 prospect in the Dbacks organization. Matt Davidson 3B - The Dbacks recieved Matt in the 2009 supplemental draft. Matt played the 2012 season with Mobile and posted very good numbers. In 135 games he batter .261 , 23 HomeRuns, 76 RBI's and .367 OBP. Matt is the #5 prospect in the Dbacks Organization. Nick Ahmed SS - The Dbacks received Ahmed via trade that sent Justin Upton to the Braves. Nick was the #11 player in the Braves organization before being traded and I believe he will be a top 10 prospect for the Dbacks. In 2012 Nick posted .269 BA, 36 Doubles, 6 HR's, 49 RBI's and a .337 OBP. Nick had a very promising winter league where he posted awesome number. Other Honerable Mentions: (NA) DiDi Gregorius, (NA) Zeke Spurill,(NA) Drory Hernandez, (#9)Andrew Chafin, and (#12) Michael Perez. Jacksonville Suns: The Jacksonville Suns are the AA affiliate of the Miami Marlins. They finished 2nd in the South Division in 2012. The Marlins have a large some of the most promising prospects out there and alot of them will see time with the Suns. 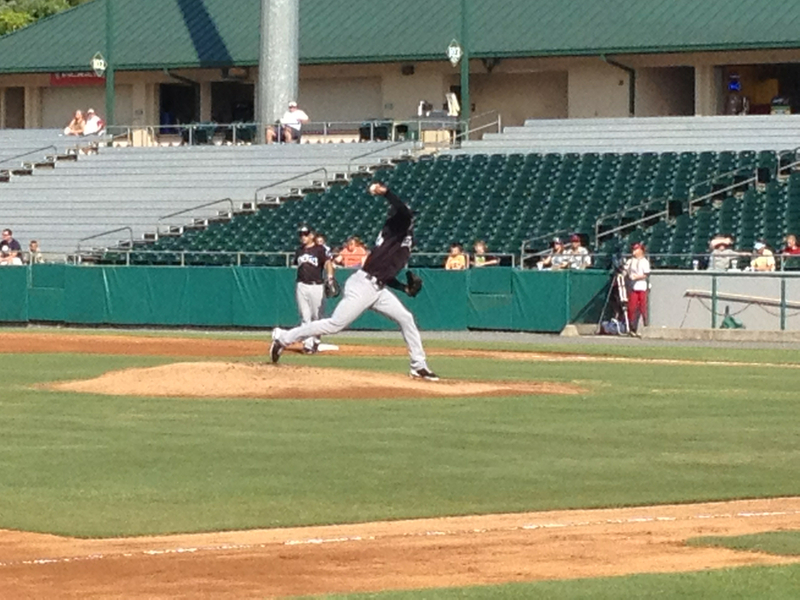 Jose Fernandez SP - Jose is the #1 prospect in the Malins organization. Baseball America graded him a 70 which they believe he will be an All Star one day. Jose was a first round pick in the 2011 draft for the Marlins and in 2012 he posted amazing numbers split between LoA Greensboro and HiA Jupiter. Jose posted a 14-1 W/L record with 157 Strikeouts and 35 walks. He averaged 9.7 Strikeouts per 9 innings. the most impressive number through is Hernandez's ERA between the two leagues he posted a 1.76 ERA. One of the best in the minors. Fernandez will more than likely start off in Jacksonville but he could recieve the call by mid season if he post the same numbers he posted last year. Christian Yelich OF - Christian was another first round pick by the Marlins back in 2010 this 21 year old outfielder has impressive legs and has a great potential. He is the Marlins #2 prospect and has a BA score of 65. Christian hit for .330 with 29 doubles, 12 HR's, and 20 SB's. Christian will likely start CF for the Suns this season and could be helping Gianacarlo Stanton roam the OF in Miami very soon. Andrew Heaney - Andrew was a 1st round pick in 2012 out of Oklahoma St. While at OK St. he led Division 1 with 140 strikeouts in 118 innings. Andrew played a partial season with LoA Greensboro last year where he posted 4.95 ERA in 20 innings with 21 Strikeouts! Heany will likely start the 2013 season with HiA Jupiter but could see the promotion to AA Jacksonville before Midseason. Mississippi Braves - The Mississippi Braves are AA Affiliate of the you guessed it the Atlanta Braves. The Braves finished last year in 4th place. The Braves have graduated most of the major talent to MLB but they still have some potential talent in the Minors. J.R. Graham SP - Graham was drafted by the Braves in the 4th round of the 2011 draft he is the Braves #2 prospect. Graham was promoted to Mississippi last year after mid season. While at Mississippi he posted a 3.18 ERA witha 3-1 record, 42 Strikeouts in only 45 innings. Depending on his spring Graham could start this season in AAA Gwinnett but could be demoted back to AA after Brandon Beachy returns from Tommy John Surgery. Alex Wood SP - Alex Wood was the 2nd round pick by the Braves in 2012 and is the clubs #7 prospect. Wood played college ball at the University of Georiga. In a short season last year in LoA Rome Alex posted a 2.22 ERA with 52 Strikeouts in only 53 innings pitched. Wood a lefty has been compared to a young Tom Glavine. Evan Gattis OF/C - Evan was drafted in the 23rd of the 2010 draft. Evan has a pretty awesome back story where he took 4 years off of baseball where he was a janitor. Gattis then went to play D-II baseball and was selected in the 23rd. Gattis peaked in 2011 where in LoA Rome he hit 22 HR's in just 88 games. Gattis then in 2012 went on to hit 18 HR's in 74 games. Gattis was a drafted Catcher but with the emergince of Christian Bethancourt Gattis has moved to the OF. Gattis was rummored to possibly get the call in 2013 but with the Braves trading for Justin and B.J Upton it could help him get some more time in the Minors. I believe he will start the season in AA but should be up in AAA Gwinnett by mid season. Other Honerable Mentions: (#5) Lucas Sims, (#10) Jose Peraza, (#12) Todd Cunningham (#18) Joey Terdoslavich. Pensacola Blue Wahoo's: The Blue Wahoo's are the AA affiliate of the Cinncinati Reds. They finished in 3rd place in 2012. The Blue Wahoo's got to host the proffesional baseball stolen base champ Billy Hamilton. Hamilton will most likely be in AAA Lousville this year so I will be leaving him off. Robert Stephenson SP - Stephenson was a 1st round draft pick by the Reds in 2011. Robert played a short season in 2012 where he posted interesting numbers. Robert went 3-4 with a 3.18 ERA in Rookie and LoA Dayton. Robert also had 72 strikeouts, Robert has shown he has the best pure stuff since the 04 draft pick Homer Bailey but, the Reds believe still needs time to develop. Robert should start the season off in HiA but he could get promoted to AA by mid season. With the Reds trading SS DiDI Gregorius he is the Reds only real top prospect. Honerable Mentions: (#6) Nick Travieso, (#7) Jesse Winker, (#14) Evan Marshall. Montgomery Biscuits - The Montgomery Biscuits are the AA affiliate of the Tampa Bay Rays. The Biscuits finished first in the South Division but fail short of winning the Southern League Title. Taylor Guerrieri SP - Taylor was a 1st round draft pick in 2011 by the Reds. Taylor posted a 1.04 ERA in the Short Season League with 45 stikeouts in 52 innings. Taylor is predicted to start the season off in LoA but with the potential this young man has he could see time in AA before seasons end. Jake Odorizzi SP - Jake has been moved around quiet a bit in the past year when he was traded from Milwaukee to Kansas City in order for the Brewers to get Zach Greinke, Then was traded from the Royals to the Rays in the James Shields/Will Myers trade. Jake has promising stuff and even recieved the call to play in Kansas City last year but with the Rays having a decent rotation Jake could start off in AA just to give him time to develop if not he will be in AAA Durham. Honerable Mention: (#7) Richie Shaffer, (#8) Enny Romero, (#9) Blake Snell, (#11) Drew Vettleson.